"The Coming of the Supermen - Part 2"
We open with Clark Kent and Lois Lane, entrusting Rafi in the care of a kindly nanny by the name of Mrs Goody. Lois is in a rush to leave, as she wants to chase a story about Lexcorp across town. Clark see's a news report on the television, of a returning Kalibak to the site of Lexcorp building, and manages to give Lois the slip, as he heads for the roof to become Superman. While on the roof, he sees Jimmy sitting there, streaming a live news feed of the current goings on. Jimmy asks Superman who the three mysterious new Supermen are, who coincidentally have arrived on the scene to take on Kalibak. Superman playfully misleads Jimmy that they are his "brothers", then his "cousins", leading Jimmy to come to the conclusion, that Superman himself doesn't know who or where they come from. Superman heads to the scene of the action, as we cut to the current battle happening at the scene, with Kalibak making short work of the three Supermen, with the aid of some "other worldly"weapons in the shape of gauntlets. While Kalibak battles the Supermen, Steppenwolf orders his men to fight on through the blasts that Lexcorp security are laying down, to protect their facility. Superman arrives on the scene, and takes Kalibak head on, he manages to almost defeat him, as Kalibak using the power of his gauntlets, to punch Superman to the ground. Elsewhere behind the Lexcorp building, a Boom Tube opens with Darkseid's father emerging from it, explaining that the diversion by Kalibak worked, and orders everyone back to Apokolips with his "prize". Back at the scene of the Battle, Superman manages to figure out how to counter Kalibak's gauntlets, and manages to defeat him. Later the three Supermen thank Superman, and introduce themselves to him, while receiving medical attention at what looks to be inside the Lexcorp building. The Supermen explain that they are from New Krypton, the survivors of the Bottle city of Kandor, now enlarged. Superman becomes aware, that they are not as powerful as he is, due to the artificial red sun from when they were shrunken and trapped in the bottle. Superman then asks the doctors treating them , where the blood samples they took from them are. The head doctor explains that they have been taken to the lab for testing. An angered Superman makes his way to said lab, and rips open the giant vault like door, demanding the blood samples back. The three Supermen try to intervene, asking Superman to calm down, only to be shoved back by the Man of Steel. Superman makes his way to Lex Luthor, and tells him he will never have the blood of the Kryptonians. And then destroys what seems to be a large data storage device. Meanwhile Lex swallows a pill, while Superman is not looking, thinking to himself, that the last place Superman will look for what he seeks is the gut of his enemy. The Supermen arrive on the scene, and Superman explains that Lex is not a friend, but an evil man. They tell Superman that they know all about Lex Luthor and the type of man that he is. Story - 3: I was a little annoyed that this issue didn't deal wit the ramifications of the cliffhanger last issue. Which saw Superman in ancient Egypt, learning that Darkseid's father (who still has no name) was responsible for building the Sphinx in particular... Which lead me to believe, that the Sphinx maybe was an important element in this story... As are other things/characters. This issue is obviously a piece of a larger picture in the puzzle that is this series. It's written like modern comics, where it did feel a little like padding/filler. Now this might lead you to think that not much happens in it, but what it does provide is larger than life action. This book has a few action scenes, that would look phenomenal on film, and that's what I feel Adams was going for, a huge blockbuster feel. As I mentioned last month, this series feels as if it's a Bronze Age story told in a modern time. It has a very classic feel to it, and if you are not a fan of this, this book may get annoying fast... Thankfully I am a fan, and though some parts took some getting used to, it did bring back a nostalgic feel for me. Adams even bought back thought balloons/bubbles! It's been years since we've seen these in a Superman comic, and it's funny to realize that you missed them all these years! With all that said, I did see that this is a more (if not over) confident Superman, who isn't afraid to use intimidation as a weapon. He was quite bad @$$ at times, which I didn't mind at all... However, he was a little too forward at times. There were more than a few questions that were left, that needed answering though. Firstly, was that Darkseid or his father featured this issue... As he looked as if he could have been either. Second, is how is Kandor and its citizens now free, does this follow the 2009 New Krypton story in its origin. And where is this New Krypton situated anyway? Adams writing is very unconventional, as he's made up his own continuity it seems, and he's constantly pulling elements from different era's of Superman lore. He reminds me of Bob Haney at times. If you don't know who Bob Haney is, look him up... Or listen to any one of the amazing "Tales of Zaney Haney" episodes from the Fire and Water podcast, and you'll see what I mean! The last couple of things I wanted to touch on were Lex Luthor and Rafi's parts in all this. Lex seems to have his hands on the Kandorian-Kryptonian blood, and I'm hoping it leads to a sinister plot, as only a Luthor can deliver. Rafi will most definitely play a big role in the coming issues of this story, I'm glad that Adams is drawing his purpose out, as it does leave you wanting more. All in all, it wasn't a bad part of a larger story. The dialogue was the main off putting element for me, as it seemed so out of place, from a different time almost, but I am still looking forward to seeing where this tale will lead us. Art - 5: I've always stated this, so I will continue to remind y'all... I'm an art guy. I love the art in comics, and most times I will buy a book if I like the art... Unless it's Superman, because I used to buy anything that involved Superman. This issue, like the last, was a visual treat, from page one. Now it may not have started where I wanted it to, but right from the get go, on page one, Adams delivers big time in setting the scene for the entire issue. At times his characters may seem over dramatic, just look at Lois's pose on the bottom panel of page one, but Adams being the master illustrator hat he is, if you try to follow the story this issue without the text, you would catch the drift of what the story is about. This is what I love about old comics, and the storytelling elements of yesteryear. Adams really delivered on that front for me. The action sequences with Superman were brilliant. And its great when an artist can choreograph his own action, because you end up with some wonderful action beats. (No pun intended). In total, there were 5 double page spreads this issue. Which I shouldn't be complaining about, as something like this from Adams is a real treat. However, reading this issue digitally, it was quite evident that Adams had designed these more for the printed page, over the digital display of a tablet. Adams in my book, being the father of the unconventional page layout, doesn't disappoint. Other than Kenneth Rocafort (Superman, Redhood and the Outlaws and Teen Titans), no modern day artist has a good grasp on unconventional page layouts like Neal Adams. But reading digital it does get distracting a little. My advice, go buy this issue in physical form to really appreciate the art. I'll still stick to my statement of inking from last month though. I'd have loved it, if Adams had a separate inker. Because at times his inks seem to heavy and overbearing. And in some panels, they look really uneven. It's still 100 times better than what I could produce, and I hate to criticize someone legendary as Neal Adams, but he had a separate inker, the finished page may have come out more crisper! Minor nitpick though. I'm still honored to review this book, and look forward to the rest of the story unfold in the coming months. Cover Art - 3: This is a very attractive cover by Adams, And Sinclair really makes those colors pop. However, at first glance, its hard to tell what Adams is trying to achieve with the composition. 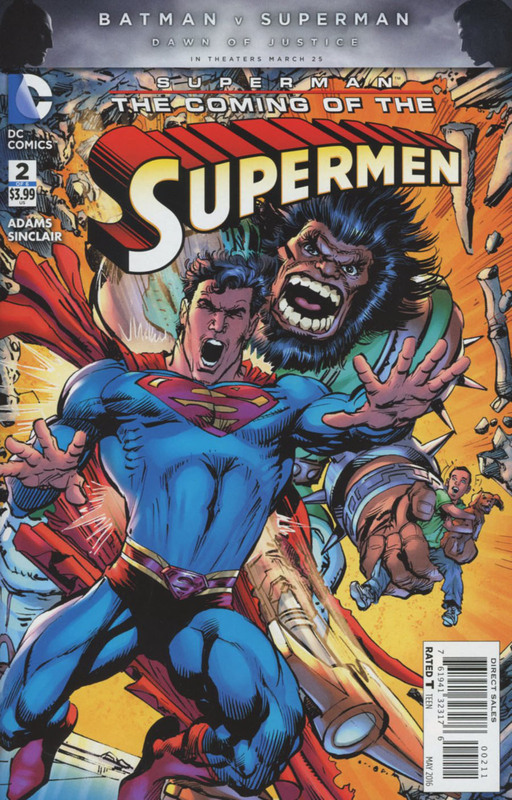 Superman is being struck from behind by Kalibak, with Rafi in his other hand, but having Superman so far forward throws the perspective off, as Kalibak is intended to be quite hulking, and obviously larger than a normal human being. Also trying to fit Superman's full figure into the cover by bending his legs back, throws off his anatomy a little. But seeing as how the cover pretty much represents the last 3 pages of this issue, I had to give it a higher score than what I originally intended.